Did you always want to join AirAsia job as a cabin crew and experience life from 34,000 feet but with time and distance with your family or friends was a big concern? Well no longer! Fly with AirAsia career and do not miss a single day with your family or friends. AirAsia operates daily flights that enable you to live your dream in the form of a cabin crew to go abroad. So, request to all the boys and girls who are interested to attend air Asia cabin crew interview, please make the registration first. But before you need to check this article carefully to know about the AirAsia jobs eligibility criteria, cabin crew job role, cabin crew salary and many more. Applicant should have a passport. Applicant has to carry Original and photocopy of any national ID and passport. All the applicant should complete their 10+2 from any recognized board or university. You have to carry original and photocopy of your higher Education certificate. referred for a valid NBI(National Bureau of Investigation) clearance. Your age should be 18 and above. Appearance flawless skin (without acne marks), No braces, No visible marks on the hands and legs. You must have nice hair. You must have signs of being good at taking care of themselves. Males may have long hair, as long as they understand if you will hire you may be required to have short hair. Working hours – Here we should list out some of the real-life working issues, such as the commuting distance, unsuitable hours, having to be away from home from time to time, etc. Note – here is some interview question list that can ask by your interviewer and also get some interview tips for cabin crew here. Ladies should have a minimum of 157 cm barefoot. Men should have a minimum of 173 cm barefoot. Note – This position is based in AirAsia ALL STARS home in Bangalore, New Delhi & Kolkata. If you don’t have a professional resume for this interview, you can download free resume sample here and if you need a premium resume from me! Which you can use for your all jobs. please mail on [email protected] (it will cost you only Rs 200 per resume) with your all details. within 2 working days, I will give you a premium resume or CV. 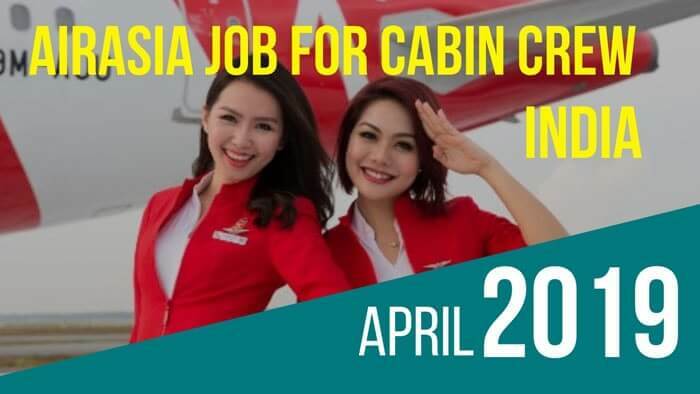 To apply online for Air Asia cabin crew hiring you to have to visit there an official page or the application page and fill up an application form online and then submit it. Then you will be done your application and wait for a few weeks then if your resume will be shortlisted. The airline will contact you for interview details. If you are fresher please check here for Air Asia interview process & stages for Cabin Crew and also you can check Air Asia Cabin Crew Salary from here. So, friends this all information will help you to apply for AirAsia job for cabin crew in India. Now you can prepare yourself and then attend the interview. We wish you the best of luck for your future. i always watch your video,post n updates even i did already subscribed to your channel along with Website bookmark. i just want to know one thing – Is height matters to Ground Staffs for any Domestic Airlines? ?